My mom cooked Verdolaga, collecting it from around the house and neighborhood. It is an authentic, ancient food, central to our Texas Mexican cuisine. Here in Houston you can find it growing in the cracks of sidewalks. Today not many cooks know about its culinary importance. Incredibly, it is disliked and considered a weed by large agribusiness. That’s unfortunate because verdolaga is super rich in Vitamins A and C, and contains more omega 3 fatty acids than some fish. Let’s not kill verdolaga, let’s eat it. The scientific name is Portulaca oleracea, and although wikipedia and other sites claim it was brought here from Asia, it is now known by archaeologists that verdolaga is native also to Texas, the Southwest US and Mexico. 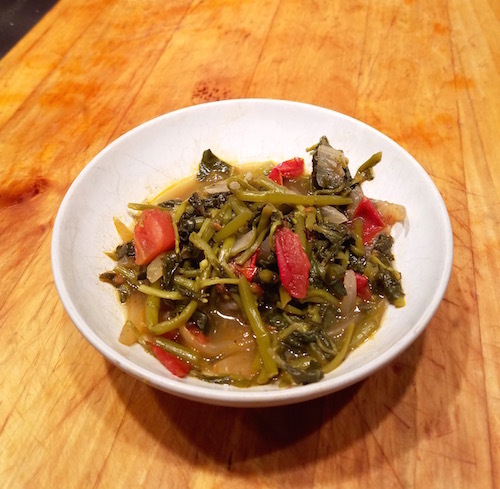 The Pueblo and Navajo people gathered and ate these fresh, crispy greens, as did the Tewa, Mescalero Apache, Pima, Tarahumara and others. 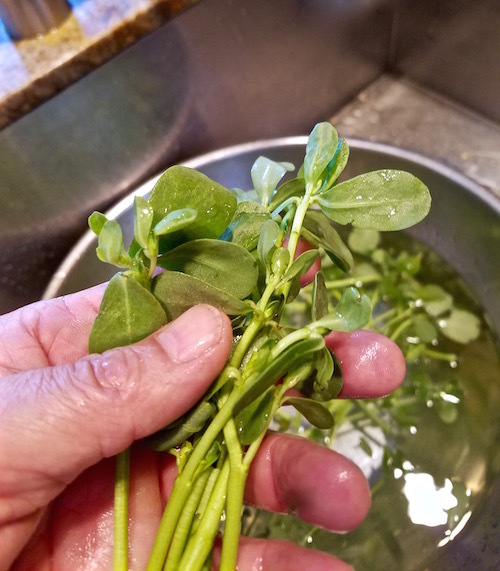 Pick the succulent leaves when they are just sprouting, in the first two weeks, when they are the most flavorful and nutritious. This recipe features the classic verdolaga combination of tomato, onion, chile. 1. Wash the verdolaga well and trim away any brown leaves and knotty stems. Place in a saucepan, cover with water and bring to a boil. Cook for 20-25 minutes until the stems are completely soft. 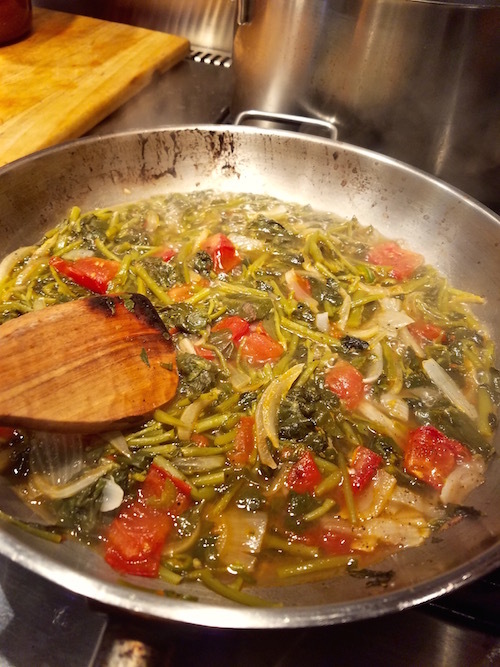 After they are cooked, use a slotted spoon to remove the greens, and place them in a strainer to drain. Set the water aside. It is a delicious broth and also makes a great stock. 2. 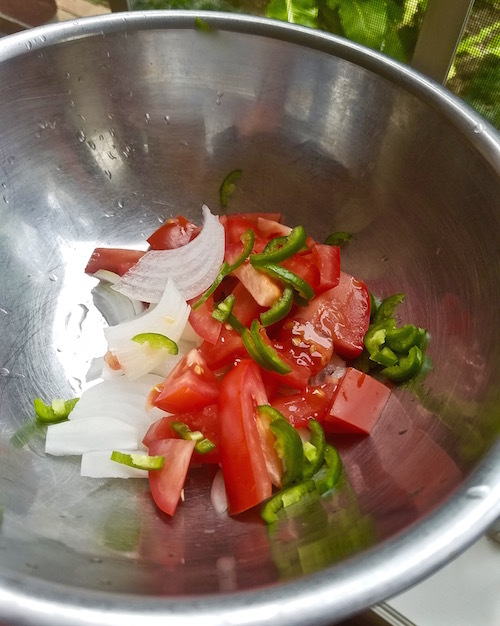 In a skillet, heat the oil, then add the onion, garlic, tomato and chile. Cook for about 3 minutes until the onion becomes translucent. 3. Place the verdolaga on a cutting board and cut it into 2″ lengths. 4. Add the verdolaga to the skillet and cook for a minute. Add 1 1/2 cups of the verdolaga broth, bring to a boil and cook for another 5 minutes. Taste and correct the salt. Add a generous grinding of black pepper. NOTE: Sometimes you’ll want to serve it as a soup, so add all of the broth in step #4.